The first wine produced at Picardy was the 1996 Pinot Noir. Picardy Pinots exhibit finesse and complexity, comparable with great Burgundies. Excellent fruit intensity, structure, pH to acid relationship and fine-grained tannins guarantee long life and excellent bottle development. The wines are also approachable young. Since the first vintage in 1996, the combination of clones has increasingly been reflected in the wine, showing greater texture, structure and complexity. 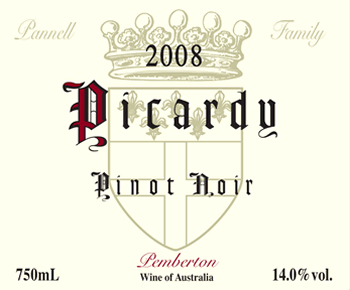 Picardy Pinot Noir consists of 5 clones: upright, droopy (existing clones in Australia) and 114, 115 and 777 (which are special selections from Burgundy). It took ten years - from the time Bill first looked into sourcing these clones, until the last one was finally delivered to Picardy from quarantine in 1999. The Pinot vines carry a maximum of 7 tonnes per hectare, excess fruit being hand-crop thinned at veraison. In order to achieve low yields the vineyard is non-irrigated and cane pruned. Picking time for the Pinot is usually around early March. The fruit is ripened to approximately 13° baume, but this is not recipe winemaking and fruit flavour ultimately determines picking dates. The fruit is then hand picked and transported to the winery (only 400 metres away) on the Picardy estate. In the winery 75 to 85% of the fruit is destemmed, the berries are lightly crushed and pumped into small fermenters. The remainder is left as whole bunches. The must is pre-fermentation cold macerated for one to four days. The fermentation is carried out at between 28 and 35 degrees Celsius over 12 to 16 days until the cap sinks. During fermentation the wine is hand plunged three times per day. The wine and skins are run directly from the bottom door of the fermenter into the airbag press, and then pressed firmly. The different ferments are then blended to allow maximum integration time (most wineries blend after oak maturation). In years when two or more clones ripen at a similar time, they may be blended prior to fermentation. The wine is settled and pumped into new to four year old French oak barriques, where it matures for twelve months. While in oak the wine goes through malo-lactic fermentation and each barrel is checked and topped up fortnightly to prevent oxidation of the barrel headspace (thus preventing development of volatile acidity). This is facilitated by all of our barrels being stored at floor level (not stacked). If required the wines may be racked during its twelve months in oak. After its time in oak the wine is racked out of barrel to a tank and then given a light filtration on its way to bottle.